Most likely because of John Howard and Bob Carr's fear mongering. A spokesperson for Justice Action Mr Brett Collins said, "Why not deal with the problem honestly and use research to guide crime control. NSW citizens want real safety, not political posturing like, more police and longer sentences." "Not more guns and capsicum spray. How about early detection and real community policing." He said. Concern about crime is one of a number of performance "glitches" uncovered by the commission in its annual report card on state services. All the publicity from the Police Integrity Commission early last year and now Bronwyn Bishops Federal Crime Inquiry late last year exposing [some, hand picked] senior police as corrupt. Ms Bishop said she will publicly air these allegations before the March 22 state election? NSW Citizens will believe her so they can make the right choice when they go to the polls? The 2003 Report on Government Services also highlights flaws in the key service-delivery areas of health, education and community services - ensuring the document will be hotly debated in the final weeks of the NSW election campaign. It has already become a political football, with NSW ministers contesting some of the findings and the Howard Government using it to attack federal Labor over its policies. On crime, the report notes that while nationally 91.3 per cent of adults felt "safe" or "very safe" at home alone during the day, only Western Australia - at 87.2 per cent - had a rate lower than NSW. NSW also came second last in a study of adults who felt "safe" or "very safe" in their homes after dark, with similar results for safety perceptions on public transport and while walking or jogging after dark. 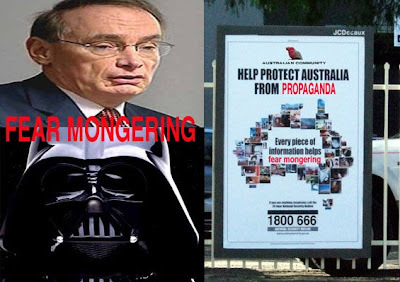 Last year the Premier, Bob Carr, acknowledged concern over the public's perception of crime. But even the International Commission of Jurists was not safe from the wrath of the rampant Premier. When Supreme Court Justice Dowd told the Senate that anti-terrorism laws were exploiting a climate of hysteria to abolish fundamental rights, Carr was quick to demonstrate how hysterical he could get. "Can't John Dowd get it into his thick head that [the CIA false flag] Bali occurred, that we have a problem here, that these threats are real?" he fumed. Although it is an important objective of the police services is to 'reassure the public' by ensuring that the community feels safe (within themselves and regarding their property) in public and private," the report states. Perceptions of safety are reported here, although these perceptions may not reflect reported crime for many reasons - for example, reported crime may understate actual crime, under-reporting may vary across jurisdictions and many factors (including media reporting) may affect public perceptions of crime levels and safety." NSW citizens led the country in their perception of the prevalence of police corruption. NSW citizens report more police corruption than any other state. Most people are frightened of police themselves and have no confidence in the Carr government at all. The report refers to an unpublished survey of community attitudes towards policing which shows that NSW citizens still harbour concerns about their constabulary. The state was less inclined to profess satisfaction with police performance. NSW was also behind other states in terms of perception of police honesty. THE WHISTLEBLOWER: Call to Bronwyn Bishop's Federal Crime Inquiry before the NSW State Election on March 22! When the Government stands by terrorism kits amid criticism and is issuing fridge door terror kit's, at $15m a 'waste' according to the critics? Perhaps critics who never went to war yet? And when masked groups are helping asylum seekers to escape and our Nuclear protesters are being arrested. Then where having our blood sucked out! The Democrats are confident they will win at least one seat in the upper house in the NSW election by tapping into voter unease about the Carr Government's tough anti-terrorism laws. In other words another propaganda green light from the west to bolster support and quell dissent and to continue the Coalition of the Killings illegal and degrading resource wars in the Middle East. The complicit federal Government says reports there are two highly trained members of Al Qaeda operating in Australia selling GI and are consistent with information it has already released. All of the families ASIO raided in October were believed to have attended the weekend camps, which have run for the past five years. GI cordial was on the refreshment list of drinks.